Last week in our initial review of the past twenty Heisman winning quarterbacks, we looked at passing statistics. This week we want to give the more athletic members of this exclusive fraternity some love and look at the rushing and combined totals of the most recent Heisman winning quarterbacks. Before we get started, this is just a reminder that these stats are not adjusted for pace nor opponents and they do not include bowl or playoff games. We’ll start with rush attempts. College statistics are kind of dumb, so these rush attempts include sacks (which are of course intended to be pass attempts), and like the NFL, the occasional kneel down. The average of 102 rush attempts does a good job of sorting quarterbacks by dual threats and pocket passers. 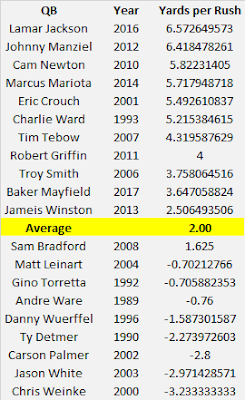 All seven quarterbacks with above average rushing attempts are recognized as dual threat quarterbacks and everyone with below average rushing attempts are known as statuesque pocket passers with a few exceptions. Baker Mayfield and Jameis Winston contributed a non-insignificant amount with their legs despite a below average number of rush attempts. 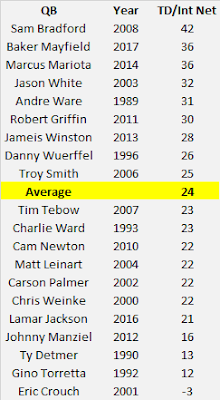 There’s also Charlie Ward who we will touch on in a bit and Ty Detmer surprisingly ranks higher than one might think here. However, once we look at the next statistic, it becomes pretty obvious that Detmer’s ranking here is a result of a lot of sacks. Speaking of that next stat, let’s move to rush yards. The difference between Lamar Jackson and Ty Detmer in their Heisman winning seasons is roughly 1700 rush yards or about the freshman campaign of Samaje Perine. 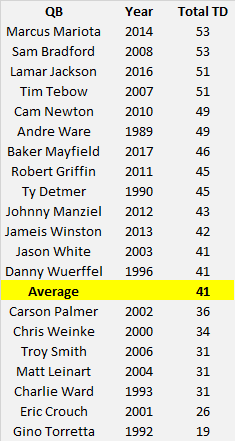 Twice as many Heisman winning quarterbacks finished with negative rushing yards (8) as finished with at least 1000 rushing yards (4). 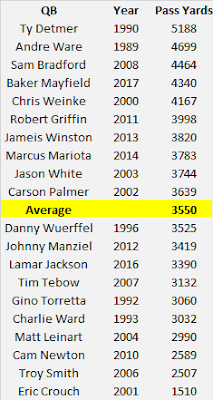 In the early 2000s, Heisman voters had a fetish for immobile pocket passers with four of five winners posting negative rushing yards (Weinke, Palmer, White, and Leinart). Of course, the other winner in that time frame (Crouch) was the first Heisman winning quarterback to rush for 1000 yards. Next up is yards per rush. No surprise that the explosive Lamar Jackson ranks first in this metric. Charlie Ward proves his worth as a runner here. While he rated below average in rush attempts and rushing yards, the future NBA point guard did a fine job of picking his spots, as he averaged more yards per carry than both Tim Tebow and Robert Griffin. 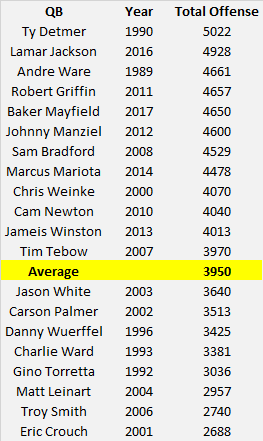 If we remove the eight quarterbacks that were in the red, the average creeps up to 4.59 yards per attempt which surprisingly makes Tebow and Griffin below average on a per attempt basis. Tebow edges out Lamar Jackson for rushing touchdowns by a Heisman winning quarterback. No real surprise here except for maybe that Robert Griffin only rushed for nine touchdowns in his Heisman winning season. The thirteen below average quarterbacks combined to rush for 37 touchdowns or less than the combined total of Tebow and Jackson. Now let’s look at total offense. Despite all the sacks, Ty Detmer ranks as the total offense king among Heisman winning quarterbacks. His immediate Heisman predecessor and kindred spirit, Andre Ware ranks third with Lamar Jackson nestled between them. Detmer’s total offense numbers are nearly double those of Eric Crouch. Again, Crouch played in a diametrically disparate offensive system, but the gulf between them is still amazing. Our final measure is total touchdowns. If you are an astute reader you may notice the total touchdowns (and total offense) don’t add up for some quarterbacks. This is because a few quarterbacks managed to catch passes and occasionally score a touchdown via a trick play. 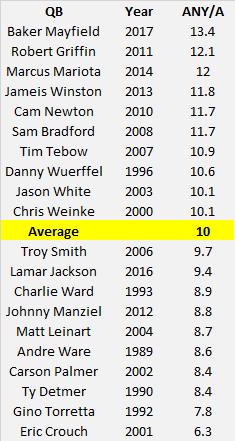 The receiving numbers are non-existent for most quarterbacks, so I elected not to give them their own category. Mariota and Bradford accounted for the most touchdowns as Heisman winners with Jackson and Tebow joining them in the exclusive ‘half a hundred’ club. As usual, Crouch and Torretta bring up the rear. In looking back on Heisman winning quarterbacks from the past three decades, a few stand out. Gino Torretta is usually remembered as one of the worst Heisman winners (especially in the modern era) and you won’t get an argument from me in that regard. Torretta accounted for a paltry 19 touchdowns in 1992 which is less than half of the average Heisman winning quarterback. He also ranked near the bottom in numerous other categories like total offense, adjusted yards per pass, and touchdown to interception ratio. The only thing Torretta did well was avoid turnovers making him more of a caretaker than a conductor. Nipping at Torretta’s heels is of course Eric Crouch. 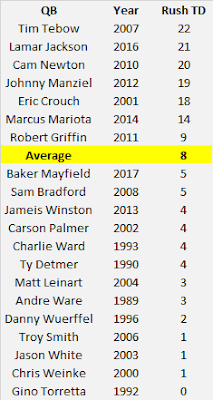 Crouch finished dead last in every passing statistic except for interceptions (primarily because he only threw 189 passes as he did finish last in interception percentage) and while his rushing numbers were quite good, he still accounted for the fewest total yards of any Heisman winning quarterback and the second fewest touchdowns. Compare Crouch’s numbers during his Heisman winning campaign to those of other contemporary Nebraska quarterbacks, Tommie Frazier and Scott Frost in their senior seasons. Frazier finished second behind Eddie George in 1995 and while his total offense checks in below 2000 yards, he accounted for 31 touchdowns (five more than Crouch) and threw just four interceptions. Frost put up eerily similar numbers to Crouch, outside of throwing less than half as many interceptions, and didn’t even finish in the top ten in 1997. What about best Heisman winners? I think your two obvious choices are either Mariota or Mayfield. 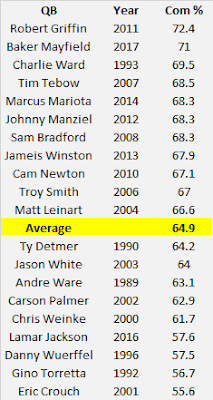 Mariota accounted for 53 total touchdowns in 2014 and had a microscopic interception percentage. 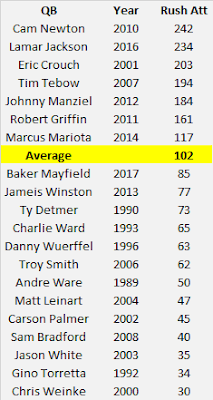 Meanwhile, Mayfield posted the best Adjusted Yards Per Pass Attempt average in college football history. 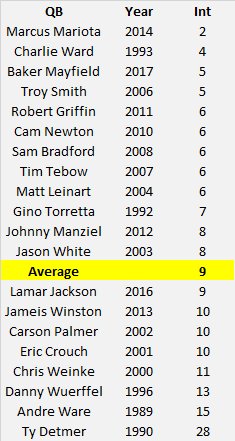 And finally, before we close out, what Heisman winning quarterback is the most underrated historically? I have to go with Charlie Ward. 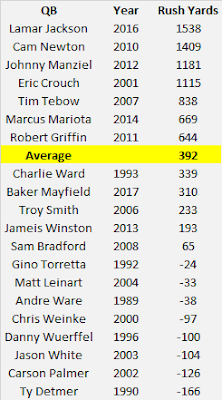 Ward didn’t have the volume in regards to pass attempts and subsequently yards and touchdowns of modern quarterbacks, but he posted a completion percentage nearing 70% in 1993, had the second lowest interception percentage of any Heisman winner in our study, and averaged more yards per rush than Tebow and Griffin in their Heisman winning seasons. Perhaps people forget about Charlie Ward because he chose to play basketball instead of opting for an NFL career. It just seems odd that the quarterback of Bobby Bowden’s first national championship team is not more widely regarded. The Heisman Trophy is perhaps the most prestigious ‘amateur’ award in sports with a rich history and unrivaled pageantry. It ostensibly goes to the best player in college football, but could more accurately be described as going to the best backfield player in college football. No non-back has won the award since Charles Woodson in 1997 and no wide receiver has won it since Desmond Howard in 1991. While the award was egalitarian among backs in the 90’s, with quarterbacks and running backs each winning four times in the decade, signal callers have gained a stranglehold on the award since the turn of the century. 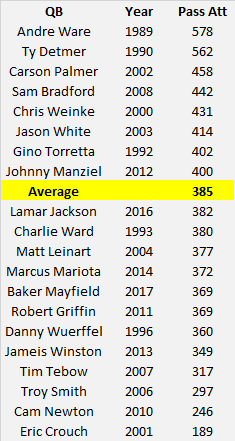 Beginning with middle-aged Chris Weinke in 2000, fifteen of the last eighteen winners (and yes, around here Reggie Bush is still considered a Heisman winner) have been quarterbacks. 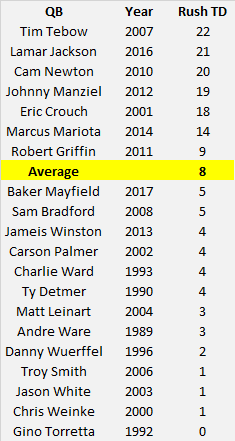 Since the Heisman is almost exclusively a quarterback award, and since we still have seven weeks or so until the season kicks off, I decided to look at the last twenty Heisman winning quarterbacks (beginning with Andre Ware in 1989) and compare their statistics in several categories. Obviously, the game has changed a great deal since Ware hoisted the award in December of 1989, not only with schemes and tactics, but also with television and streaming services, as well as our understanding of the game. As the title of this post suggests, this is part one in a multi-part series. I wanted to look at a number of different statistics for Heisman winners and decided to break those stats into digestible pieces. We’ll start with some passing statistics for Heisman winning quarterbacks and next week, we’ll dive into rushing and total offense stats. 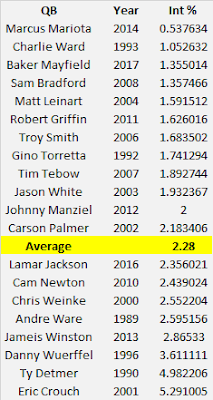 For each stat, the twenty quarterbacks will be ranked and the average (mean) will be included to give you an idea of how far above or below average each quarterback ranks. This next paragraph deals with some housekeeping information, so if you want the meat of the article skip down. First and foremost, the statistics we will be examining are raw. No, there is (virtually) no risk for salmonella, but these stats are not adjusted for opponent nor era, and they are not calculated on a per game basis. Bowl and playoff statistics are not included because those games happen after the Heisman Trophy is awarded. With that out of the way, let’s get started with our first statistic: pass attempts. 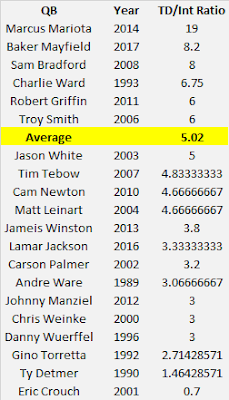 I know I said in the intro that the game has changed a great deal since Ware hoisted the trophy, but its cool to see him top this list in terms of volume of pass attempts. This shows you have far ahead of the curve Houston and BYU were in terms of utilizing the forward pass in the late 80s and how crazy it probably seemed to ‘real’ football coaches who preferred to run the ball into the line three times and then punt. Most of the other Heisman winners from the 90s all rank below average in this metric although Gino Torretta surprisingly shouldered a lot of Miami’s offense in 1992. Spoiler alert: Eric Crouch will rank at or near the bottom in every passing measure. He was a different kind of quarterback in a different offensive system, but his numbers look more like a Big 8 quarterback from the 80s than any of his Heisman winning contemporaries. Next up is completion percentage. Bill Polian was criticized for suggesting Lamar Jackson change positions prior to the NFL draft. 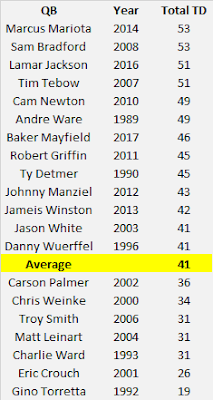 While Polian’s comments hearken back to the league’s previous (hopefully previous) biases against black players being quarterbacks, his low completion percentage here would concern me, especially in an era of high completion percentages. Of course, a great completion percentage for a Heisman winner does not necessarily portend professional success. I was very surprised Robert Griffin’s 2011 campaign ranked as the best completion percentage by a Heisman winner. And while these numbers are not adjusted for era, I think its safe to say that Charlie Ward has the best era-adjusted completion percentage. No other 90s Heisman winner was above average in completion percentage, but Ward is comfortably third having completed nearly 70% of his passes in 1993! Next up is total passing yards. Ty Detmer is the only Heisman winner to top 5000 passing yards in a single season. 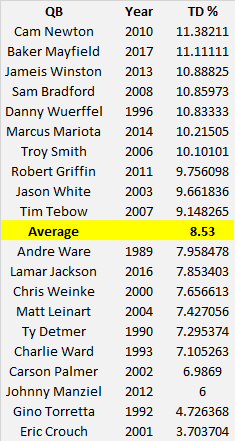 In fact, his total is more than the combined passing yardage of the two lowest ranked players in this metric. 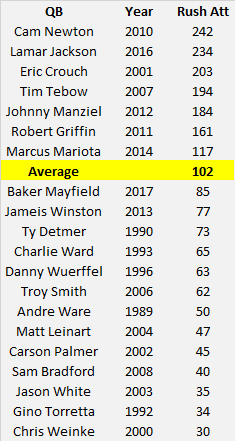 Once again Detmer and Ware were ahead of their time (or at least played in systems that were ahead of their time), as they topped the Heisman winning average by over 1000 yards each. Next up is passing touchdowns. I already touched on how Eric Crouch would populate the bottom of these passing stats, but look at Gino Torretta. Those 19 touchdowns seem more indicative of a third team All-Big East quarterback rather than a Heisman winner. And while we’re talking about Torretta, I decided to sort the Heisman winners by their passing touchdown percentage. 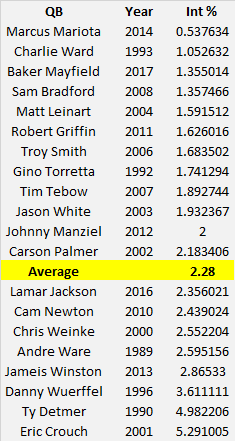 As you may recall, while Torretta was below average for passing touchdowns, but he was the only 90s quarterback that was above average in pass attempts. 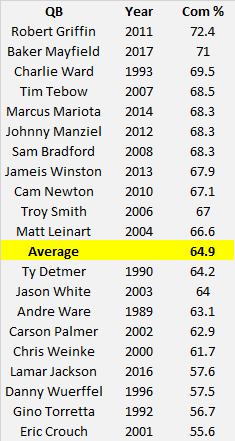 In terms of passing touchdown percentage he ranks significantly below average among non-dual threat Heisman winners. Haha. Look at that number for Ty Detmer. 28. That is comical. His performance pretty much destroys the curve. He threw more than three times the number of interceptions as the average Heisman winner. As you can observe from the bottom of the list, passing has gotten much safer in the last ten years. Jameis Winston is the only Heisman winner since 2003 to hit double digits in interceptions. Conversely, Charlie Ward and Gino Torretta were the only Heisman winners prior to 2003 to throw fewer than ten interceptions. And while I denigrated Torretta for his low touchdown percentage a few moments ago, we need to give him credit for being careful with the ball and not squandering any of that South Beach talent he had around him with dangerous throws. Charlie Ward also continues to shine in efficiency metrics as his interception percentage is topped only by Marcus Mariota’s minuscule mistakes in 2014. Next up is touchdown to interception ratio. Obviously, if you only throw two interceptions all season, you should rate highly in this area. Mariota’s ratio is more than double that of silver medalist Baker Mayfield. 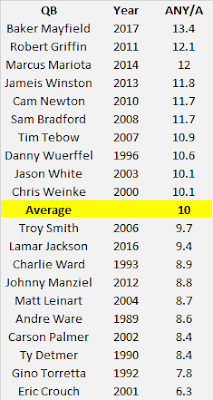 I know you may be getting tired of this refrain, but Charlie Ward again stands out as the only 90s winner with an above average ranking in this metric. Next up is touchdown to interception net. If you like basic math, but don’t care for any of that fancy division, this stat is for you. Instead of dividing touchdowns by interceptions, we are instead subtracting interceptions from touchdowns. 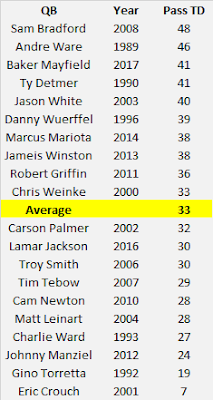 A pair of Oklahoma quarterbacks are able to steal the crown from Mariota here, while legacy touchdown passers like Andre Ware and Danny Wuerffel move from below to above average. 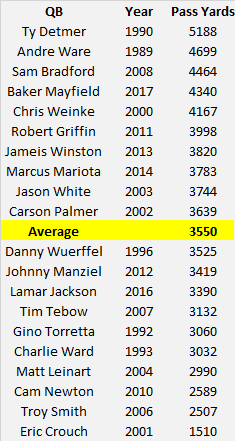 Finally, our last statistic is Adjusted Yards per Pass Attempt. It does involve a formula, but its pretty simple. You take yards per pass attempt and award a 20 yard bonus for each touchdown and subtract a 45 yard penalty for each interception. Mayfield’s 2017 campaign is far and away the best AY/A season by a Heisman winner. For comparison, the difference between Mayfield’s AY/A and that of second place Robert Griffin is roughly the same as the difference between Griffin and eighth place Danny Wuerffel. 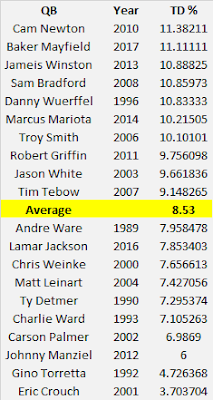 Speaking of Wuerffel, he is the only 90s quarterback to rank above average in this metric. The bottom of this ranking is populated with the usual suspects (Crouch and Torretta), but other polished passers with great supporting casts at a selective, private, west coast institution also rate pretty low here (Leinart and Palmer). This concludes part I of our look at Heisman winning quarterbacks. 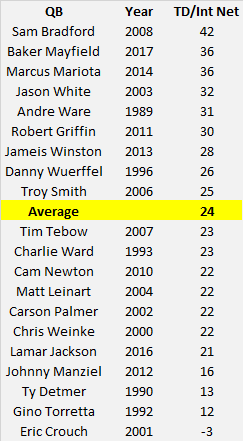 When we return next week, we’ll look at how these 20 gentlemen rate in several rushing and combined statistics. 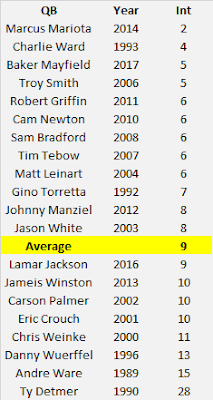 Then we’ll summarize the results and see which quarterbacks consistently rated above and below average and maybe even hand out some superlatives. See you next week. Last week, in our ongoing look at the AP Poll, we looked at teams the pollsters probably over-rated. This week, we are going to look at teams that the pollsters under-rated. I know, you are thinking we already did that. However, in this instance, the pollsters managed to rate these teams (i.e. they finished ranked), but they should have rated them higher. Once again the numbers we will be comparing are the final rankings from the AP Poll and the SRS rankings. For a primer on SRS, follow this link. 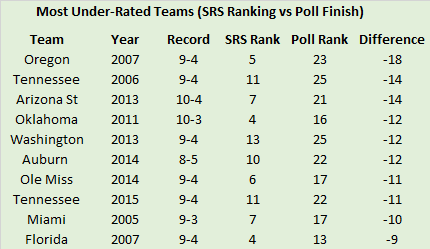 Since 2005, which teams have seen the biggest disparity between their SRS ranking and their final AP ranking? Glad you asked. The top-ten are listed below. Congratulations to Oregon. Mike Bellotti’s penultimate teams ranks as the most under-rated since 2005. As you may recall, the Ducks were ranked second in the country and perhaps on course to play for the national title before an injury to star quarterback Dennis Dixon devastated their offense and contributed to them losing their final three regular season games. The Ducks did rebound to win the Sun Bowl, but their final ranking near the bottom of the AP Poll belied their strong statistical resume. What do these under-rated teams all have in common? For starters, they all came from BCS/Power 5 conferences. Half of the top-ten came from the SEC and eight of the top-ten came from either the SEC or Pac-10/12. Every team also lost at least three games. Intuitively, this makes sense. If a Power 5 team loses two or fewer games, they will probably finish pretty close to the top-ten and not be capable of being under-rated by this methodology. In addition, six of the ten teams lost their bowl game. For the most part, losses cause teams to drop in the polls, so those teams had their otherwise solid seasons end on sour notes. This is especially true for a pair of Peach/Chick Fil-A Bowl losers, Miami and Ole Miss. The Hurricanes and Rebels were decimated in their bowl losses to LSU and TCU respectively, so the final image any pollster had of those two teams was not positive. Finally, every team on this list save Arizona State failed to win their conference or division. In several cases (Tennessee 2006, Florida 2007, Oklahoma 2011, Auburn 2014, and Ole Miss 2014) this meant there was a national title contender directly adjacent in the conference standings. And in Arizona State’s case, while the Sun Devils managed to win their division, they lost in the conference title game and were then upset in their bowl game. This two-game skid severely impacted their final ranking. That concludes another summer of polls. Next week, we'll take a look at how Heisman quarterbacks have evolved over the last 30 years or so. Stay tuned.